In today’s world of online sales ads, having a good video of your horse can make a big difference between selling him quickly or not. 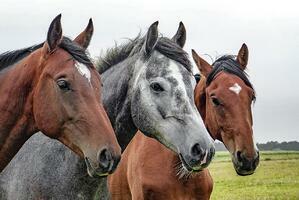 So how do you make sure that your video portrays your horse well? Don’t worry - we’ve got some tips to get you started. If you’ve ever watched shaky handheld videos of horses for sale, you know how difficult it can be to tell much of anything about a horse’s movement in such a case. Always use a tripod for your camera when taping footage of your horse. If you can’t use a tripod for some reason, then use a fence or jump standard to steady the camera as you film. Before you begin taping footage for a sales video, first put effort into preparing the horse much as you would prepare him for a show. While you don’t have to bathe the horse, be sure that he is well groomed and tidy. Clean his tack and use a clean saddle pad when riding him. Have him styled appropriately for his discipline - if he’s a hunter, for instance, take the time to pull his mane and trim his whiskers. The rider’s appearance will complete the horse’s presentation, so be sure the rider is wearing clean, well-fitting and appropriate clothes. Show clothing is not necessary, but be sure that the rider is outfitted well enough to appear neat and tidy. If your horse is a jumper, it may be tempting to tape him jumping a few courses in the ring. While seeing your horse jump courses is something that a buyer would certainly want, a buyer will also want to see how well your horse moves on the flat, as well as his conformation. While conformation shots can be just photos and don’t necessarily have to be videotaped, it’s a great idea to tape your horse performing a variety of movements under saddle. You can also include footage of him moving at liberty. Always be sure to highlight his talents and strengths, and definitely showcase him performing the discipline you’re marketing him for. It can be difficult to film and create a quality sales video. While you may be able to create a video with some basic editing software and a good camera, if you are marketing an upper-level horse and have the funds to do so, it is generally best to hire a professional to film and edit the video for you. A professionally produced video can attract more attention to your horse’s sale ad and may capture the attention of more potential buyers. Regardless of what route you decide to go, spend time preparing and filming your horse until you have footage to create a quality sales video. As always, we are here to help. If our products and services can ever be of assistance to you in the future please don't hesitate to contact us. 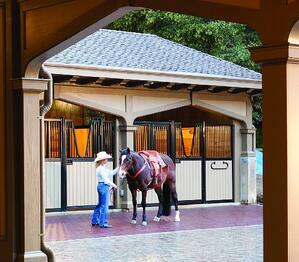 Take a look at everything we have to offer from horse stalls and barn doors to flooring and accessories!